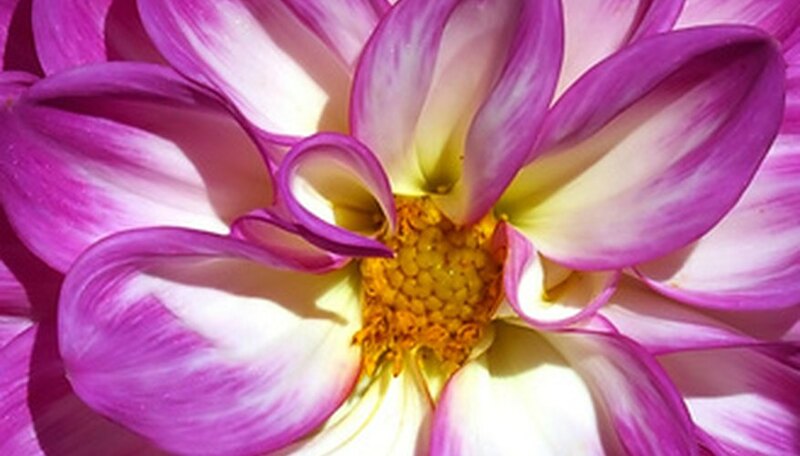 The dahlia, a summer-blooming annual, is native to Mexico and thrives when planted in sandy soil in full sun. There are thousands of dahlia varieties, with more being hybridized each year, ranging in height from 1 to 6 feet with flowers as small as 2 inches or as large as a dinner plate. The dahlia is a member of the aster family and quite easy to grow. Pull weeds in the dahlia bed as they appear. Apply a 2-inch layer of mulch around the base of the dahlias. Mulch helps the soil stay moist and discourages weeds. Water the dahlia slowly and deeply once a week. A soaker hose works well for this. The soil should remain moist, not soggy. During hot periods, water twice a week. Fertilize dahlias one month before bloom, and again in early August, with 1/2 cup of 5–10–5 fertilizer, sprinkled in a 2-foot ring around the plant. Water the soil after laying down the fertilizer. Stake tall dahlia varieties. The 4 to 6 foot stake should be driven into the ground when the tubers are planted. If adding it later, drive it into the soil next to the dahlia. Tie the dahlia loosely to the stake when it reaches 1 foot in height, and tie it every additional foot that it grows. Pinch off the terminal bud, located just above the second pair of leaves, and the two smaller buds on either side of it, when the dahlia plant reaches 15 inches in height. According to horticulturists at Ohio State University this procedure will produce two main stems on the plant. They also suggest when the next buds to appear reach 1/4 inch in diameter, removing the two buds on either side of the buds. Use your fingers to pinch them off. Prune dead flowers often to promote new blooms. Use sharp pruning shears to snip them from the plant. Protect the dahlia from snails and slugs by applying snail bait to the soil in the spring. Cut the dahlia stems back to 6 inches when they have completed blooming. Cover them with a 6-inch layer of mulch as winter approaches, prior to the ground freezing. If you prefer to store the tubers over the winter, dig them out of the ground and place them in a cool, dry place. Pesticides and fertilizers may contain chemicals that are poisonous. Read and follow all label directions, wear protective clothing during application and store the chemicals out of the reach of children and pets.